Several people have shared these stories about what Facebook is (here comes the scare quotes) “doing” about fake accounts.– Facebook is testing a feature that alerts you if someone is impersonating your account (from mashaable.com) and Facebook is reportedly testing a tool for detecting profile imposters (The Verge)… and everyone else is re-reporting it– Facebook’s testing a feature that alerts you if someone’s impersonating you (Naked Security). Note that Facebook does not explain how “it detects that another user may be impersonating you”. Though the notification process is automated, profiles that are flagged as impersonations are manually reviewed by Facebook’s team. The feature, which the company began testing in November, is now live in about 75% of the world and Facebook plans to expand its availability in the near future, says Facebook’s Head of Global Safety Antigone Davis. If the process is automated, that leads one to guess they are using their own facial recognition software. Gee if only I thought of that and like blogged it 9 times. This is the first mention I have seen of a person inside of Facebook working on this. She seems to be on Facebook. Or is she?. She is on LinkedIn. This is interesting too, because the frame it more in the lens of harassment or “reputation smearing” — the article suggests Facebook is aiming at women who are victimized by perpetrators making fake accounts of women… Note that “Facebook” never mentions catfishing scams, the ones I am roped into, where people create fake accounts using my photos to lure women into false romances, leading to asks for money. To them it’s as if it does not exist. Hmm, “impersonation isn’t necessarily a widespread problem on Facebook”? How does one quantify “not widespread” like in relation to likes of cat photos? It’s not like I have documented thoroughly in ridiculous detail numerous impersonations over the last 6 months. But I am a small catfish bait compared to Alec Couros, who has not only blogged about it, but been on TV. 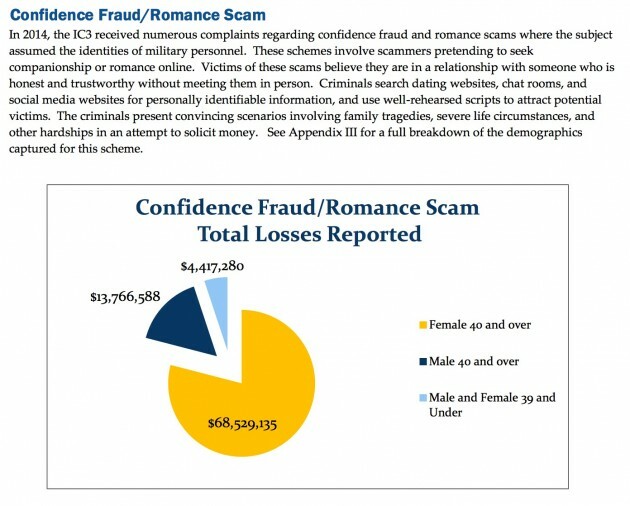 That pie chart adds up to $86 million lost by victims of these scams and these are just the ones where they were impersonating military personnel. How the bleep is this not a widespread problem? It’s impossible to quantify the extent because of the shroud of shame over victims, most of whom likely never report their victimization. Criminals search dating websites, chat rooms, and social media websites for personally identifiable information, and use well-rehearsed scripts to attract potential victims. The criminals present convincing scenarios involving family tragedies, severe life circumstances, and other hardships in an attempt to solicit money. Yes, one might say it’s not just Facebook involved, but Alec and I have made 2×4 over the head clear how prevalent this is. Why am I not optimistic? Because if I get one of these magic notifications, and indicate an impersonation, what happens? Oh yes, the same teams / process that ignored reports for over two weeks of a fake account using my photos all the time claiming that it was in line with their community guidelines? The same team that never uses a name? The same process that is shrouded in mystery? VConnecting Today to #DigPed Cairo: "Fermenting Ideas in the Middle Yeast"
Help Me Yoda-Kin, Can The JED-API Power a Certification?